To make sure a printed family tree exists that will outlive their computer data records. Learn more about the 7 steps of preserving your genealogy records. A printed family tree chart will dramatically outlive digital records which may only survive one generation if refreshing techniques aren't used. Today's technology simply doesn't allow us to save our digital work in such a way that it will be readable for extended times into the future. text-only report doesn't graphically show and tell as nice of a story as a printed genealogy chart. A printed chart increases the interest of both your immediate and extended family members. Relatives who were hard to get information or photos from in the past gain new interest and enthusiasm for your genealogy project when they see the family tree in printed form. Printed reports, notes, and CD's can easily get lost or thrown out by future generations who don't immediately understand what they are, or their significance. 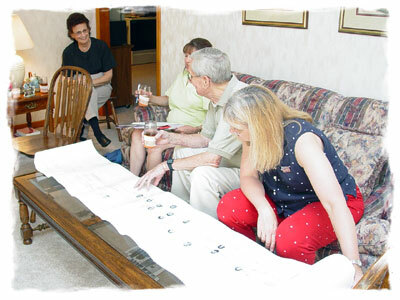 A printed genealogy chart is easily recognizable as a family heirloom of importance and will be saved. A printed genealogy chart allows you to better see what you have and what you're missing. It is easier to get a clear idea of who everyone was and their relationship to each other from a printed genealogy chart than it is from a text report or book. Anyone who has spent time researching their ancestors already knows that nobody else can really understand the amount of time, expense and travel that is involved in compiling a family history. Sharing your documented results in the form of a printed family tree is the ideal way to truly show off all of your hard work. Genealogy is an unforgettable journey with stops along the way to enjoy the tangible results of your hard work in printed form. We're so sure you'll love our family tree printing services that we confidently provide a complete money back guarantee on all printing orders. We look forward to being able to work with you and your family so that you can enjoy all of the benefits of a printed genealogy chart. If you haven't already done so please watch our video about our services and see examples of charts which we can design for you if you're not designing your own chart.